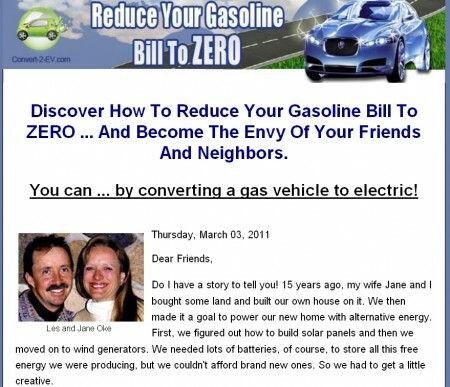 Today I have decided to do an e-book review on “Build Your Own Electric Car” from www.convert2ev.com. The authors of the book is a couple by the name Les and Jane Oke. A quick Google search, I found out they also run www.off-grid-living.com. The website showcase life living off the nation electricity grid. Both sites are related to a same topic which is [tag-tec]green energy[/tag-tec] and helping the environment. So far so good. First thing I notice about the e-book is its horrible looking cover design. But we don’t judge a book by its cover even though there are a lot to be judged. They could have paid $100 to get an e-book cover designed by a professional. But lets move on. Generally, the e-book is pretty decent and informative. 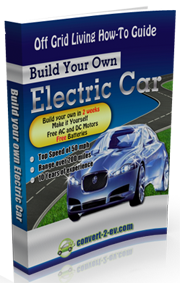 Build Your Own Electric Car is selling and $49.97 as of October 2008 and is quite competitive compared to other EV conversion guide on the web. As a bonus, they also include 4 other e-books free of charge. These bonus e-books cover topic related to green energy such as how to live off the grid, solar power, wind power, bio diesel etc. Since Convert 2 EV is offered under Clickbank, there is the standard unconditional 60 Days Money Back Guarantee. Meaning, if you buy the book and you don’t see any value, you can ask for your money back from Clickbank. My verdict: It is a good introductory book for anyone who is looking for ways to cut their gasoline expenses. It is understood that most people would not have the skill nor the time to convert an electric car themselves. Then again we should not be ignorant. If we were to send our car to be retrofitted into an EV in a professional workshop, at least we have some basic knowledge on electric cars. This is to safeguard us from being charged for unnecessary parts and work done.